As for the features of this products, we will start introducing them with a steel frame which is ultra-sturdy and makes it very easier for the users to set it up on any kind of terrain. It has much larger space on the inside because of the straight sidewalls which feels more like your home and a nice sum of windows, vents, and roof. 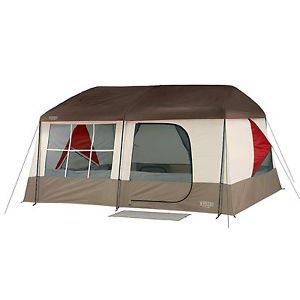 Wenzel Kodiak Tent – 9 Person Features. There are some of the major features which are needed to be reviewed in detail so let’s get going. Steel Frame for Easy Setup. There a lot of substandard tents when takes hours to setup and that is why we review and recommend tents like Wenzel Kodiak Tent – 9 Person so that you can get some quality products. This top quality tent has an ultra-sturdy steel frame which is very easy to setup in the ground and it would only take few people and minutes to set it up. Two Rooms and Miscellaneous Stuff. When your tent works like your own home, you wouldn’t need anything more than that. With two rooms in a single tent, each with gear lofts, hanging pockets, mud mat, and storage duffel. Being in this tent, you will feel like in your own home and all the stuff you have on your camping adventure will be safe. Plus, two rooms brings privacy for family and couples. Large Interior Space and Straight Walls. Tents which have bent walls towards the inside already takeaway some of space you could use but the product in review Wenzel Kodiak Tent – 9 Person is something different. After being setup, its walls are straight which gives you a larger interior space which you could definitely put to more use. A strong steel frame which is easy to setup. The tent would holdout easily in hard weather conditions. Made of Polyester Sheets and Poles of High-grade steel. 8-10 people can sleep easily. Maybe a little too expensive for most people as compared to other tents. Windows may not stop cold breeze to make you shiver. While dealing with a large group such as of 8-10 people, this tent would just be perfect however, with lesser people, it would be foolish to spend money on this test and also because of its weight which you will have to carry.